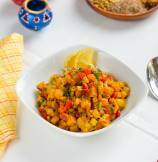 Day 12 of "15 days to Thanksgiving"
Sharing with you flavorful, curry infused, potato, delicata squash, and poblano chili hash. 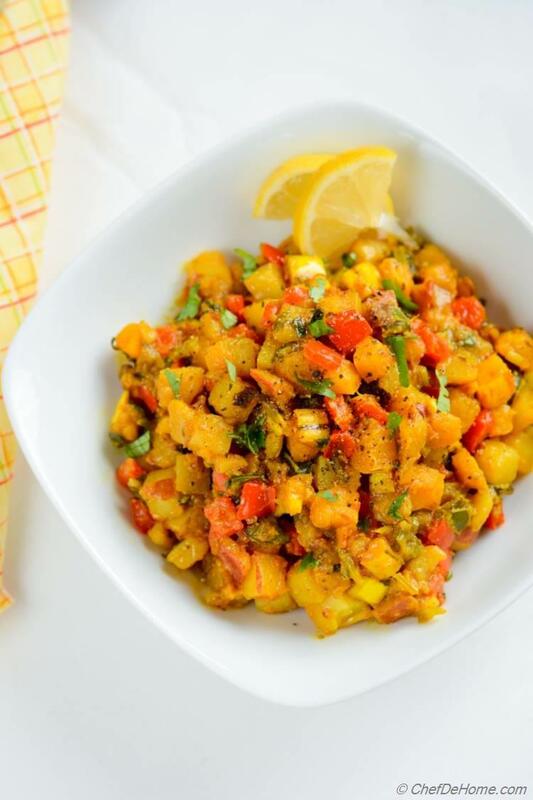 This hash has many layers of warm and mouthwatering fall flavors - sweet squash, hot and zesty poblano and curry spice, and then crisp potatoes with hint of lemon juice, everything is so scrumptious together. 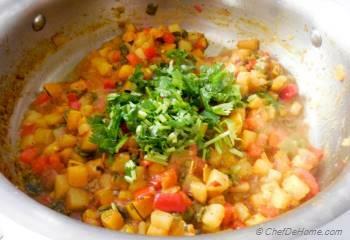 Potato-Squash Curry Hash can also be a great base for serving leftover turkey after thanksgiving. Dice cooked turkey, once hash is almost towards done, mix in the turkey and saute 1-2 minute extra to infuse flavor in turkey. 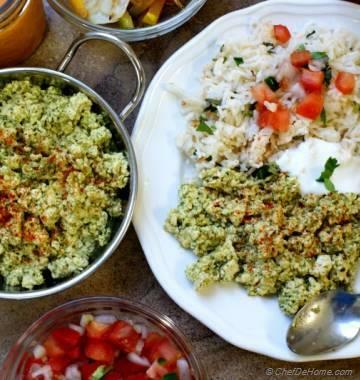 Serve for breakfast after thanksgiving or pack some for your guests to take home. 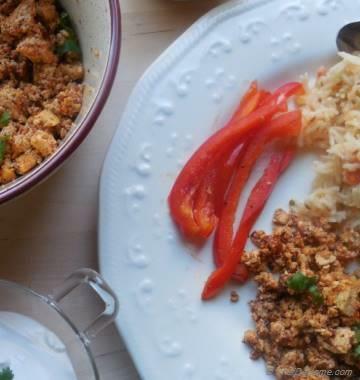 Or serve some roasted and sliced turkey on the side with lemony curried hash. 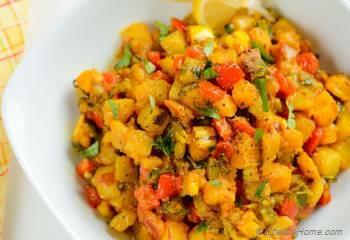 I have used delicata squash for this hash. Since I ate it first time, I am in love with delicata squash. Smallest of all squash family, delicata squash has soft and edible skin (no need to peel skin before cooking!! Hurrah!!!) and also it cooks relatively faster. 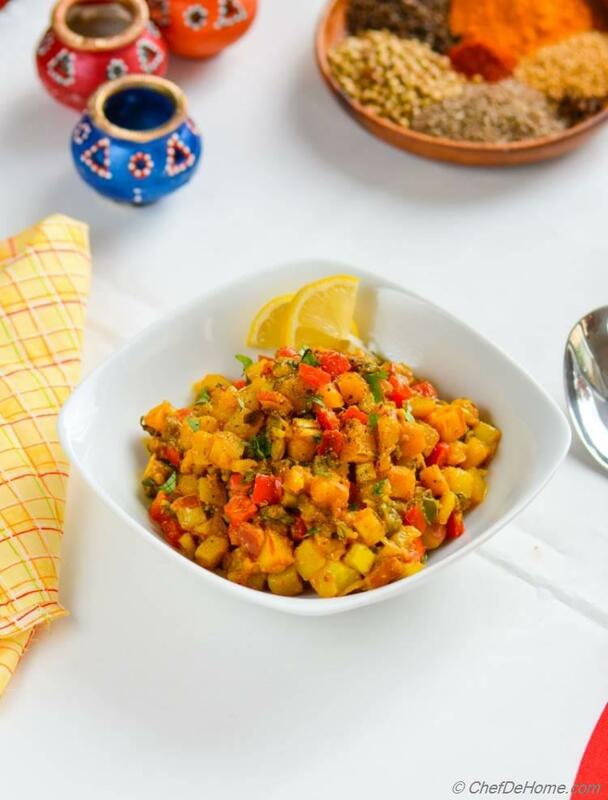 Curry powder and lemon are two of my favorite ingredients to pair with sweet squash, that sweet-sour bite with some spice-kick is always welcome! 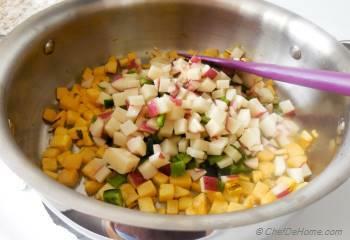 I added potatoes in this hash to balance the sweetness of squash and also to make substantial servings. For dinner, I served Potato-Squash Curry Hash with some roasted chicken and Indian Naan Bread on the side. If I had turkey, I would have incorporated cooked turkey into the hash. 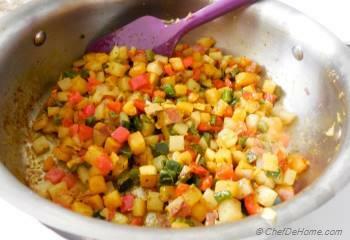 If you have time for breakfast, make this hash and top it with a fried, sunny-side-up egg and enjoy!! 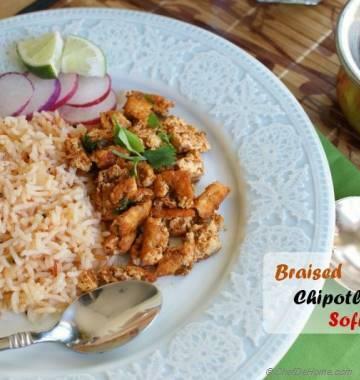 Total Time 25 minutes Prep Time 5 minutes Cook Time 20 minutes Difficulty Easy Yields 4 Servings Serves 4 Notes 4 substantial or 6 side servings. 1. 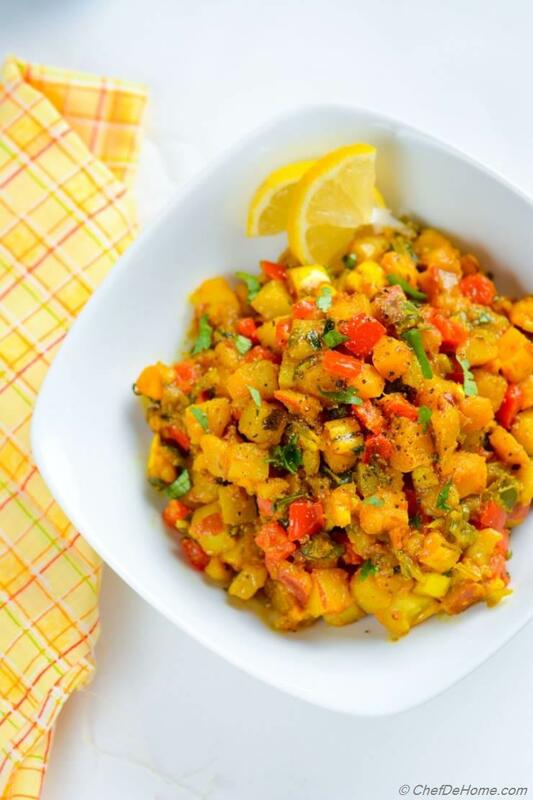 Heat oil in a wide pan, add squash, diced poblano, and potatoes, cook stirring often for 12-15 minutes or until potatoes are tender and squash skin has softened. 2. At this stage, add bell pepper and curry power and cook on medium heat until potatoes are fully cooked, and are little crispy at the edges. Piyali, thank you so much! A hearty side resplendent with the colours of the fall with the Pablano adding the spikes. Simple yet lots of flavors going on.